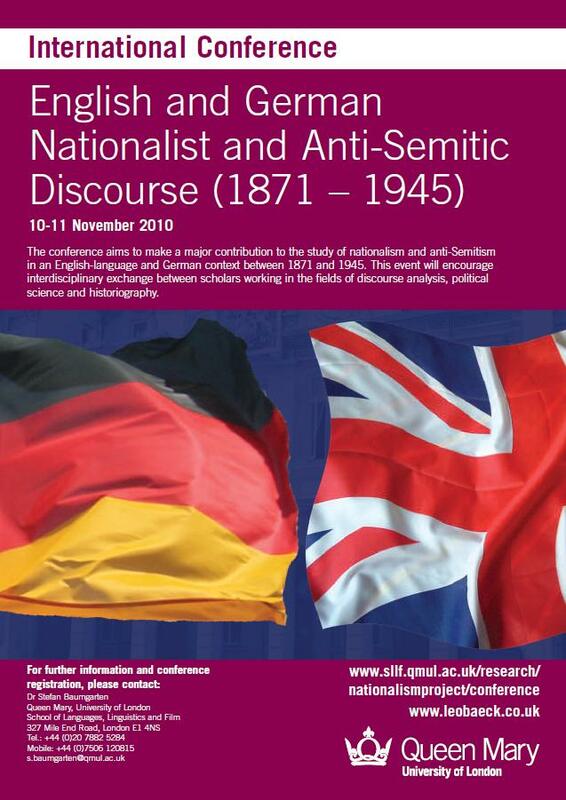 This international conference aims to make a major contribution to the study of nationalism and anti-Semitism in an English-language and German context between 1871 and 1945. The event will be a major step forward in encouraging interdisciplinary exchange between scholars working in the fields of discourse analysis, political science and historiography. The conference will also provide an opportunity to found an international Historical Discourse Working Group. This interdisciplinary study network will continue to meet regularly after the conference. Keynote Speakers: Prof. Ruth Wodak (Lancaster University) and Prof. Andreas Musolff (University of East Anglia). 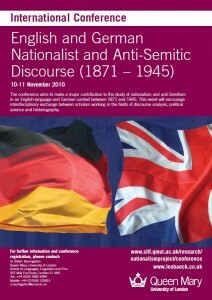 Conference Co-ordinators: Professor Felicity Rash, Dr Geraldine Horan, Dr Daniel Wildmann and Dr Stefan Baumgarten, in association with the Leo Baeck Institute (London) and the Centre for Anglo-German Cultural Relations (Queen Mary, University of London). 4:00: Martin Weidinger (Universität Wien): Fridericus, Bismarck and Cromwell: Historical Narratives as Part of a Nationalist Project?